This entry was posted on Sunday, May 24th, 2009 at 12:00 am and is filed under Show. You can follow any responses to this entry through the RSS 2.0 feed. You can leave a response, or trackback from your own site. As opposed to the Law of Moses, this is something Jesus never edits, revises nor abolishes in his sayings/teachings. If anything, this is the personal creed he lived and died by: Mar 12.28-34; Lu 10.25-28; Matt 22:35-41; Jn 5.44 [17.3]. Your comment astonishes me. Where or when did Jesus edit, revise or abolish the Torah of Moses, which you mistakenly call Law)? 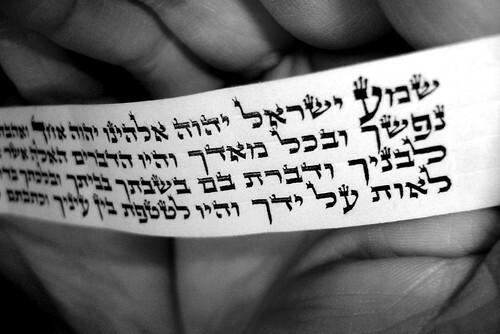 You applaud the Shema, which  is misquoted – missing is an all-important connective ‘and’;  continues to v.9 and incorporates all of Torah, but you reject the validity of the Torah. Green, J. B., McKnight, S., & Marshall, I. H. (1992). Dictionary of Jesus and the Gospels (537). Downers Grove, Ill.: InterVarsity Press. The “Law” or “Torah” refers to the first five books of the OT, while the “Prophets” includes the rest of the OT, all of which was held to have been written by prophets (cf. Matt. 13:35, which cites Ps. 78:2; on “Law [and the] Prophets,” cf. Matt. 7:12; 11:13; 22:40; Rom. 3:21). but to fulfill them. Jesus “fulfills” all of the OT in that it all points to him, not only in its specific predictions of a Messiah but also in its sacrificial system, which looked forward to his great sacrifice of himself, in many events in the history of Israel which foreshadowed his life as God’s true Son, in the laws which only he perfectly obeyed, and in the Wisdom Literature, which sets forth a behavioral pattern that his life exemplified (cf. Matt. 2:15; 11:13; 12:3–6, 39–41, 42; also Luke 24:27). Jesus’ gospel of the kingdom does not replace the OT but rather fulfills it as Jesus’ life and ministry, coupled with his interpretation, complete and clarify God’s intent and meaning in the entire OT…The OT remains an authoritative compendium of divine testimony and teaching, within which some elements (such as sacrifices and other ceremonial laws) predicted or foreshadowed events that would be accomplished in Jesus’ ministry (cp. Gal. 4:10; 5:1) and so are not now models for Christian behavior. Rom. 10:4: End probably includes the idea of both goal and termination. The Mosaic law has reached its goal in Christ (it looked forward to and anticipated him), and the law is no longer binding upon Christians (the old covenant has ended). Since Christ is the goal and end of the law, righteousness belongs to all who trust in Christ. Rom. 10:5: Paul quotes Lev. 18:5 regarding the righteousness that is based on the law, to show that those who keep the law will attain life. But as Paul has already shown, life will not come in this way since all violate the law (Rom. 1:18–3:20). Another excellent program Sean. Keep up the good work Brian Kelly. I’m so glad that you and others have been so diligent in calling our attention to the true Christian “creed” of the Bible. Our God, Jehovah, is “one,” and fully worthy of our love and praise. Hey bro still unsure if your receiving my emails or not. let me know. Take care of that familia. Hi Carlos. Yes, I receive your emails. Thank you for sending them.